Confession: I have a turkey addiction. 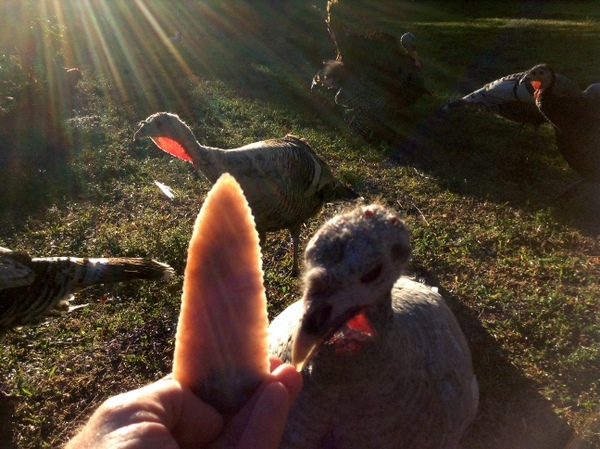 (Pet turkeys) As the addiction matured, so did my thirst for knowledge about the amazing turkey. Yet the information was just not out there on the web. After trial and error with our first pet turkeys my wife and I were soon (and unexpectedly) giving away 200 pet turkeys a year. However the identical questions kept being asked: care, food, space & interaction with other animals. (The same questions I had asked) and so naturally I wanted to share the information we had learned and decided to create a web page. Confession: I am nearly 100% computer illiterate (and still am) & yet began searching web companies to build me a web page. And the journey almost ended right there. Yes-done. Because my cautious steps and inquiries were blocked by a wall of overwhelming technical jargon and then the cost. Most sites had a basic signup fee but then began to add the “extras” and the next thing I knew, I was looking at seven to nine hundred dollars. --Which I could not justify that expense just to share pet information with people. Oddly enough what drew me to Solo Build It! was the readily apparent fake reviews coming from the array of competitors. -Even though I have no class room training in computer programing or web design, a shill is a shill and they just stand out to scam you as do fake reviews. Also, the name Solo Build It! was decidedly not clever, not gimmicky- the name was right to the point-which I liked. Then the price caught my attention. Far cheaper than the other sites I had reviewed. Solo Build It! had No extra fees and offered a generous no risk trial period. I began to read everything I could about Solo Build It! and realized I had found the company to do business with. The Solo Build It! Action Guide has a “Ten day Big Picture” guide and that was/is a little misleading -and that is the only complaint I would have with Solo Build It!. “Ten step program” might be a better name; because the steps (days) make you focus, make you research, understand, ask, learn and sweat: Is your concept/idea oversaturated on the internet or is there no demand for your idea/business? Consequently some of my Solo Build It “days” stretched into months. Of course I have a full time career in Optical fiber optics and there was a little resentment from the home front: “What are you doing?” was the question I had to answer while I researched key words. Using the Solo Build It! brainstormer tools, I learned why I could never find information about pet turkeys on the internet. There was no demand for that information! Blunt to the point. No one was looking. No one was asking. For example Wild turkeys have wildly popular searches and an overwhelming amount of providers. Pet turkeys however....well, I was looking and......well I was looking. Solo Build It! Tools indicated my website content/idea would never attract a lot of traffic. Nevertheless that is the hobby I had chosen. Stuck with it and now nearly every day I get emails from people around the globe with questions about their pet turkeys. However Solo Build It! has done all the brain work for me- the web pages are easy to build- drag and drop. And like my schools in the USAF- I appreciate the hard work I was forced to do up front, but I also appreciate the help in the forums and advice the Solo Build It owner Ken Evoy sends out. Basically Solo Build It! Is a family that wants everyone in the family to succeed. I have also learned that there are web providers that are now less expensive than Solo Build It! (I think one even had a Super Bowl commercial - you have to love competition) and I probably would have even gone with the cheaper sites back when reviewing/searching for a web page builder- but I have to wonder-do the Solo Build It! competitors offer similar brainstormer tools and support structure or are you just getting a web page no one looks at? I did not know whether to be sad that any company’s business model is to deceive people -to rob them of potential success- or should I be impressed with Solo Build It! -For obviously the company paying for the fake reviews had recognized the “best” company to attack. Then I saw that Solo Build It! had documented the fake reviews and had even done an extensive study to test the claims of the fake reviewers. The results are remarkable. But then sadly I considered that our politicians are not trustworthy, lawyers are suspect (until you need them) and a company pushing fake reviews to beat their competition, -just part of our culture. But trust is paramount and should a company pushing fake reviews get your money? That is like re-electing a crooked Washington politician—You sort of know what to expect. I would offer caution if coming across the negative false Solo Build It! Reviews. I was once one of the under-informed pre-customers, expecting-hoping for honest reviews on the internet and except for the poorly written false reviews that warned me something was rotten-I would have fallen into that trap. Be careful folks! And best wishes.